Editor’s note: The event date has been changed to Saturday, February 11, 2017. Courage is strength in the face of pain of grief, and this year’s 2016 Empowering Hearts Honorees possess enough courage to not only support themselves but inspire their families and empower their communities. Our honorees Martha Aguilera, Monica Blanco, Kamila Diaz, Nicole Feast-Williams, Kim Flores and Janelle Percy are looking forward to meeting you at our gala on Saturday, November 5. We are thrilled to announce that the Santa Clarita Mayor Pro-Temp, Dante Acosta is our Master of Ceremonies this year. Dante moved to Santa Clarita with his wife Carolyn nearly 30 years ago. Dante grew up in a single parent household after his father passed away when he was 11. His mother started a family clothing boutique and instilled a strong work ethic and the spirit of volunteerism in the family. Dante has been active in our community for a number of years and has helped the William S. Hart Museum, Santa Clarita Valley Rotary Club and Old Town Newhall Association, as well as being a Board Member with Circle of Hope, Inc., and coached little league and drama. For all these reasons, we are delighted he has honored us by being our Master of Ceremonies. Yorleni Sapp, Executive Director said “I am thrilled that Dante Acosta is our master of ceremonies for this year’s Empowering HeArts gala. I have known Dante for many years and he has always been a strong support of Single Mothers Outreach. 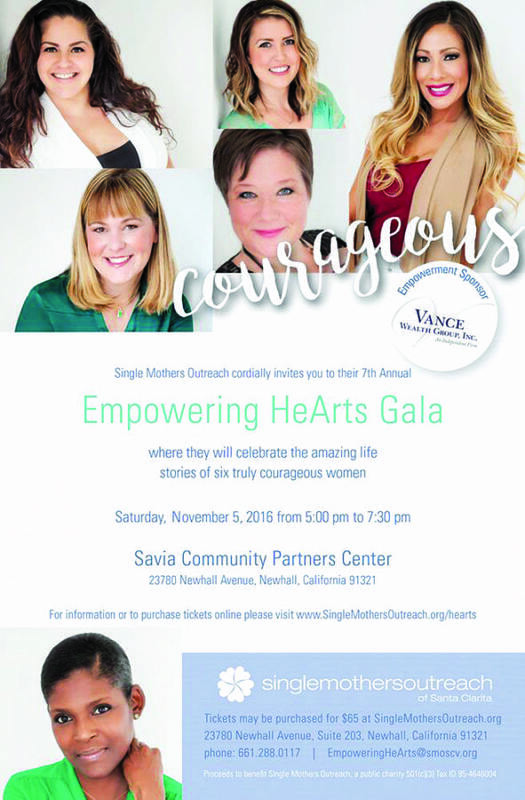 Our event is coming soon and we are so excited to welcome him, our artists and our honorees as well as the community to our stunning gala event on November 5.” To purchase tickets please visit http://singlemothersoutreach.org/reserve-tickets/ What is Empowering Hearts? Empowering HeArts is an annual celebration of women who have changed lives and shaped their communities. It bridges the worlds of social action and artistic expression in an annual arts competition. Honorees are nominated by the community and selected by the Single Mothers Outreach (SMO) Board of Directors and Event Planning Committee. The Empowering Hearts Gala presents the creative works of Santa Clarita Valley artists who create unique and inspiring art forms inspired by these real life stories. It is SMOs hope that through sharing these powerful stories in word and art, these extraordinary women will impact and inspire others to rise above their own circumstances. Empowering HeArts is SMO’s signature fundraising event. All proceeds from the event are used to support programs that empower single parents to effectively care for their families.